There are a lot of potential fire sources in your own four walls, for example open fire such as candles or a fireplace. Also an iron, cooking utensils or numerous other electrical devices can cause fire. Smoke detectors can save lives! In case of a fire or smoke emission every second counts giving the chance to extinguish the fire or to get somebody or yourself out of harm's way. 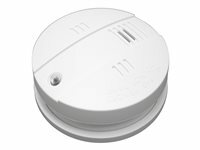 The POPP Smoke Detector detects resulting fire and smoke emission reliable. In case of emergency it alarms acoustically and sends alarm signal to Z-Wave network so that all other smoke detectors and sirens in range can be alarmed. That ensures that the alert reaches people in all floors as well as in the night while they are sleeping.Thanks to Z-Wave wireless technology you can define further actions triggered by the smart home control center in case of an alarm. To enhance safety, escape routes can be secured with automated lighting and unlocking or locking of shutters and doors. Beyond these functions the POPP 2-in-1 device can be used as an independent indoor siren which can be integrated into an existing security system. Within your Z-Wave smart home network the smoke detector can be connected to other sensors such as door/window contact sensors or leakage sensors. In case of an alarm (e.g. burglary or flood) the acoustic signal will be different from the signal in case of fire.